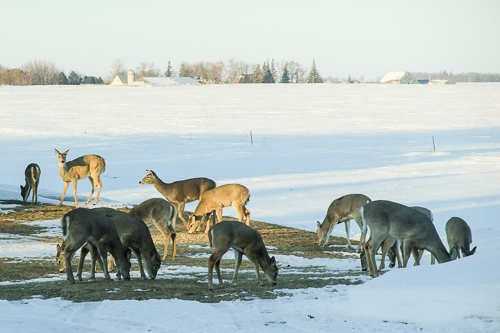 Deer feeding on the kindness of a land owner. Early March, 2011. The season of Winter was coming to a close, in actuality, winter seemed to end in mid April. There was so much snow in the 2010 – 2011 Winter that by February, the wildlife was really hurting. A lot of area farmers put out hay or corn for the wildlife. My parents would put out corn and every day around 4pm in the afternoon between 30 and 50 deer would show up in their yard. They would seem to appear out of nowhere, eat their fill and disappear again. Once the snow thawed enough that the deer could forage, they stopped coming. I’m not sure if the deer my parents fed would have died without the food, but I’m sure at least some would have. I think they would have been weaked and more susceptible to the Coyotes that inhabit the area as well. This entry was posted in Uncategorized and tagged copyright ryan ware, deer, farm, rural, wildlife, winter. Bookmark the permalink.